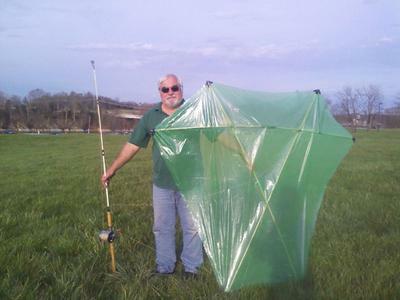 After my initial success with the 4-foot Barn Door kite last fall, I decided to build the 6-foot version next. I finally got to fly it at the local riverside park and it performed quite well. There was a moderate wind (I am guessing 10 to 15 MPH) and it went straight up and out as if on a rail. It was very stable and only bobbed and weaved when the wind would swirl and/or gust. I noticed that strong sustained gusts produced a right-hand loop, so I intend to adjust by carefully sanding the horizontal spar on the opposite side to make it a bit more limber. This only occurred in the strongest gusts - which was probably near the kite's top wind speed tolerance. I read the section on KAP and was intrigued by the possibilities, so, on a whim, I decided to attach my cell phone (which has low resolution video capability) to the kite string about 30 feet below the kite and see what happened. 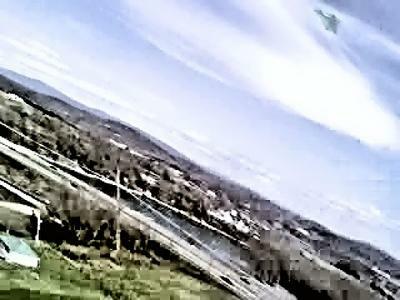 I sent the camera up about 3 or 4 hundred feet and then brought it back down. I had captured about 9 minutes of video and after going through it frame by frame, picked out some of the most interesting ones. I am including one here which managed to catch the kite flying above the local area. The resolution is very low and the quality is poor, but it definitely got me interested in the possibilities of KAP! Basically the kite will anchor one end of the line and the boat with a drift sock (sea anchor) will anchor the other end. In between and submerged by weights and buoys are the baited hooks. In theory, with a steady wind blowing in a direction across a wide portion of the lake (several miles), the whole contraption should move steadily and slowly across the lake with some steering capability using the boat's outboard as a rudder as well as the electric trolling motor. The key will be a good steady wind. I will report with my results when I get back. And, yes, hooks on a kite line are dangerous, but I have a lot of experience with trotlines and I intend to securely weigh down each end of the line with a ballast and a float, so the kite will pull against the weight/buoy most directly which should keep the main line fairly stable - until a 30-pound catfish is hooked to it! John: The main problem is excess weight, and you might also need to get the towing point closer to the top edge of the kite. My original design uses thinner dowel, and it also has more sail area. So you can definitely go down another step in dowel width. Parachute nylon should be *much* better than cotton for a kite of this size. This approach makes it easy to shift the towing point fore and aft until the kite flies well. On your kite the towing point will probably end up somewhere between the top edge of the sail and the horizontal spar. Viewed from above, with the kite laying flat on the floor. You should soon have a Barn Door that flies just fine! I bought your book influenced by my neighbor boy whose dad was gone on business and the kid had to make a barn door kite for class. If it flew he got an A if not a C. He came to me for help and since I hadn't flown a kite in 60 years and had never seen a barn door kite before I did a lot of research and your book was the best source. The boy and his dad bought material and the kid sewed it into the barn door shape. Dimensions are 37" horizontal spar, 20.5" top flat and 13" bottom flat with overall length of 29" from top to bottom. 3 spars intersect to form an equilateral triangle approx. 9" to a side with 5/16" dowel lashed together with tape. Putting holes through the sail with a nail, a bridle was fashioned approx. 9" on all 3 lines. They were joined at the center with a plastic washer to which the flying line was attached. Maiden flight was a disaster with kite reeling out of control in light wind (5mph) and crashing from 7ft breaking the horizontal spar. I landed my "expertise" and succeeded in breaking one of the diagonal spars. I have spent literally days working on this thing, amending the spars to 1/4" and changing bridle lengths and adding parallel tails. Nothing works! We finally purchased some parachute fabric and sewed a triangle kite which finally works. The boy will get his A grade and be happy but I am determined to make the barn door fly. I think I will need to change material from cotton to parachute material but am unsure if the locations at the spar intersections will work. Thanks for the kind words, Tim. Yes, I probably should try some more fine adjustments to the upper bridle loop attachment point before sanding/filing on the spar. That is a great tip on assessing the spar symmetry - I will check it right away. Worth every star of the 5 :-) You've covered kite trimming, KAP and kite fishing all in the one submission. I'll probably end up transferring this post to the section for KAP contributions, which could do with another post. Just before you trim any wood from the horizontal spar dowel, it might pay to check that the dowel is indeed stiffer on that side than the other. Just rig the bow-line and drop a ruler down to the mid-point on each side. Both measurements should be pretty much the same. If not, the stiff side will read a little less. In which case, out with the wood file. Point is, with an upper bridle loop, it could be the sliding knot that is not quite centered. It's also handy for trimming out a slight turning tendency. Looking forward to another post sometime! It's interesting that during the lifetime of this site, more and more people are choosing the BarnDoor over other designs.